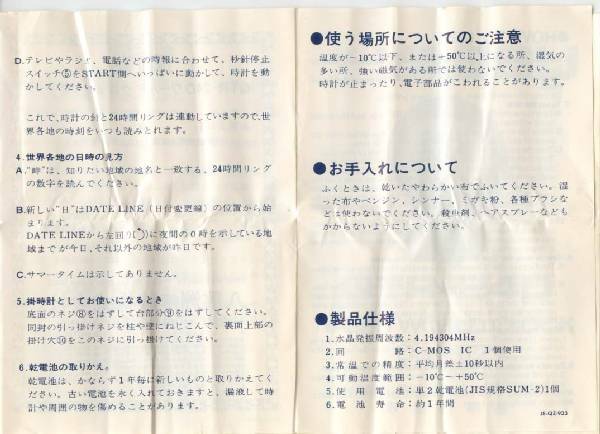 We receive many letters and emails every day at Fox Tango asking how to fix Yaesu products of all types! With all the mail coming in we often feel like the local Radio Shack store. You know: "You got questions, we've got answers" but with Radio Shack, don't always expect them to be the right answer. We do our best by trying to accommodate everyone who writes the club by sending back a reply and sometimes we even give you the right answers, well at least we try! 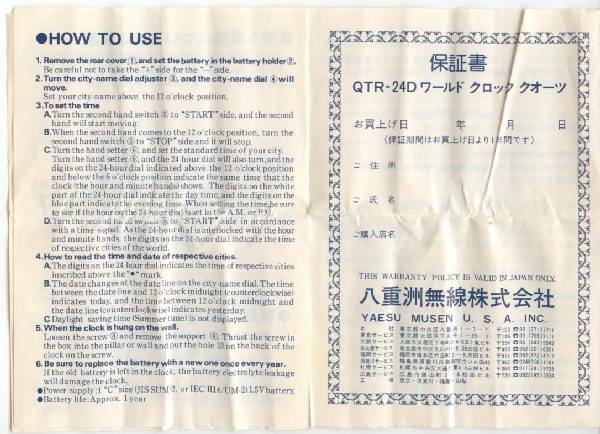 One of the least understood Yaesu accessories for the radio amateur is the QTR-24 clock and we often get questions from club members asking about repairs to these things. 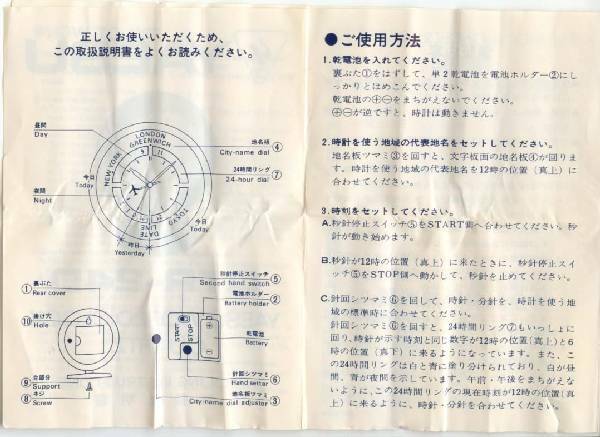 In turn we hope the following will be of some assistance to you, if you're brave and care to venture beyond the world of vacuum tubes and transistors, you might try fixing your own QTR-24. If you have tried to fix the clock and still can't seem to keep it running properly then Email: ClocksRus or visit Http://www.clocksRus.org for service. 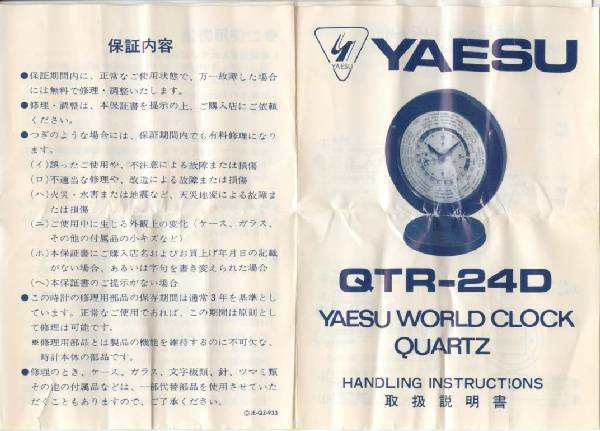 One of the Yaesu accessories from the mid 1970s that most hams are least familiar with is the QTR-24 clock. That being the case most of us will put a new battery in the clock and if it's running slow we will crank up the speed adjustment on the rear of the case. As these clocks have now become some 30 to 36 years old more often then not just replacing the battery and making an adjust will not always fix an inoperative clock. We sometimes find problems in the QTR-24 movement but more often then not a proper cleaning might just bring the clock back to life. The QTR-24 and 24D is not unlike other clocks that were made hundreds of years earlier. All clocks have some means of delivering power to its gear train be it by weights or a main spring wound up once a week or once a day. All the power in a wind up clock is stored in the clock main spring, a weight driven clock get it's power by the force of gravity on the weights themselves and you have to physically wind that clock or pull up the weights for it work. Once wound up the power in all clocks is held back by the movement time train (gears) which will eventually yield the end result turning the gears and eventually the hands of the clock. The QTR-24 is only different in that this clock is powered by a pulsating magnetic movement powered by a single 1.5 Vdc "C" cell. When power is applied to the clock a magnetic field will build up in a small coil in the clock, this magnetic field is then pulsed on and off by a single transistor circuit thus providing our clock with a pulsating magnetic field that will be converted to mechanical power much like a pendulum that delivers power to the gears of a wind up clock. The pulsed magnetic field in turn moves our one jeweled movement in one direction and a small spring will push the movement in the opposite direction of the magnetic field. The resulting movement back and forth delivers power to the clock escapement thus driving the gears and second hand. (Pix 1) QTR-24 movement partially disassembled with power applied for testing. (Pix 2) Using 1.5Vdc from our bench supply our movement can be further tested once cleaned. As seen in photo #1, the QTR 24 movement has been carefully removed from the clock and is ready for bench testing. Since the QTR-24 runs on a single "C" cell battery there is no reason we can not test the clock on our work bench like any other piece of electronic equipment by applying 1.5Vdc from our electronics bench supply. When operating properly the one jeweled movement should move freely and fast as noted in photo #2. Power from this movement is then delivered to the clock escapement this will then turn a very small (pink) gear in rapid succession with the movement of the magnetic power source. Herein lay the problems in that many of these clocks will no longer keeps accurate time or they stop altogether. We will need to look into our movement a little further to find the source of these problems problem. Due to the fact these clocks are now 30 or 35 years old, one can only assume the clock was never intended to be in use this long and most if not all of them will need some degree of cleaning or a slight lubrication. Little lubrication if any is recommended on this clock due to the fact that most of the gears are made of plastic. However they will accumulate dirt and the the movement will slow down or eventually stop altogether. In photo #3 we can see the QTR-24 movement removed from the clock and partially disassembled ready for testing. Applying a ground to the chassis from your 1.5Vdc bench supply the positive lead will go to the red wire which in turn delivers DC voltage to the circuit board and so on. In this photo the back of the movement case has been completely set aside to gain access to the gears, the sweep hand gear (second hand) has been bulled back for inspection. 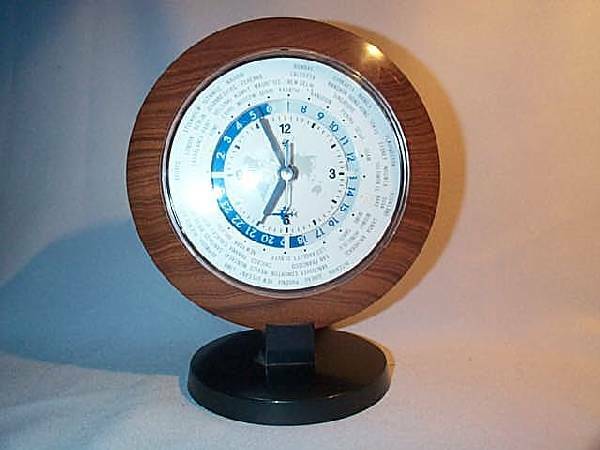 In the case of this particular movement the clock would run but would not keep proper time no matter how much adjustment was made on the rear case adjustment scale. (Pix 4) With the second hand gear completely removed from the clock movement we can see where years of grease have congealed into a sludge in turn slowing the movement down to a point where the clock no longer keeps accurate time. Enough sludge, oil or grease and dirt can completely stop the clock and the magnetic movement will not have the power required to move the gear train. (Pix 5)Simply removing the gear and cleaning with a mild solvent will remove some if not all of the sludge build up. Using care in disassembly, cleaning and reassembly will likely yield a properly working clock mechanism when you are finished. With the clock movement disassembled carefully inspect all gears for wear and dirt, not only checking the gear itself but the shaft where it mates with both sides of the movement case. 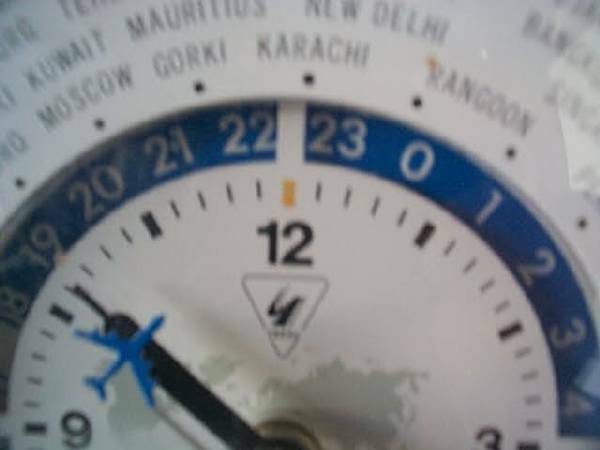 (Pix 6) Another problem area that creates drag and robs the clock of power is the 24 hour circular time indicator on the front of the clock, this resides directly behind the face of the clock. With the metal trim ring removed from the clock, the glass set, the hands will need to be removed very carefully. Griping the hands with your finger tips from both sides will allow for lifting the hands directly straight and upward. With the hands removed this will allow you further access to the works behind the face itself. Once the hands are removed you can then lift out the clock face by carefully lifting the tabs from inside the clock in order to push the face forward for removal from the clock itself. Be very careful in lifting the metal tabs that hold both the face and the metal trim ring. Too much bending back and forth on the tabs will break the tabs off altogether creating a whole new set of problems for you. So always take your time, use a good light at the work bench with a magnified lens so you can see what you are doing (Even if you are young with good eyes) a magnifying lens is a must for all service work. Note the 24 hour plastic time indicator is held in place by a "C" clamp, carefully remove the "C" clamp with your hand over it during the removal process so it doesn't fly across the room some place and become lost. Gently lift the 24 hour dial plate and put it aside. More often then not these 24 hour dial plats will become yellowed with age if the clock was sitting anywhere near a window. They become discolored due to sun light, there is little that can be done to make one white again once it has become yellowed, except replace it with another plate from a parts unit. (Pix 7) The thing to note here once the 24 hour dial plate is removed is the white residue build up on the shaft. Note in pictures six and seven the white plastic residue built up on the shaft shown above. This is cause by the 24 hour face plate having turned round and round for 30+ years and only God himself would likely know just how many times that would have been in 30 or 35 years. Looking at photo #7, this one is actually not all that bad. I've seen far worse then this where the white plastic was actually created a power build up behind the 24 hour plate, this particular movement is relatively clean. With the 24 hour time indicator plate removed, clean all the surfaces with a mild solvent such as lacquer thinner to remove all the white build up form the plastic worn on to and around the shaft as well as on the clock case itself. Most professional clock repair shops will clean an entire clock movement in an Ultrasonic cleaner assuming there is no other problems that need attention. We are not saying you have to go that far when cleaning this movement, that is why I recommend the use of lacquer thinner as it is cheap and readily available mild solvent for removing grease and sludge build up. Use all cleaners and lubrications in MODERATION. No need to flood the works with cleaner or lubricant. (Pix 8) (Pix 9) With the 24 hour time plate removed and the white residue removed, it's time to start the reassembly process. It's important to note when working with clocks that less is more in the way of lubrication. In the case of the 24 hour plate and the plastic gears found in the QTR-24, I prefer to use an synthetic based lubricant called super lube. The use of a synthetic based lubricant will allow for the lubricant to stay where it's applied and provide for a smooth surface for the 24 hour dial plate to slide against the shaft and the plastic case. Super Lube can be purchased from Merrits Clock Supply or you can call them on the telephone for a free catalog. Along with the lubricant I recommend the use of a blunt end needle applicator or pocket oilier as shown in photo #9. The super lubricant should only be used where slightly heavier oils are needed as in the case of the 24 hour dial plate and it's associated gearing. Again when working with clocks and oils, LESS IS MORE! Too little or no lubrication a clock movement can stop, too much lubricant a clock can stop, so use only a small amount on clock shafts and gears. When lubricating any clock always us an oil that is recommend for clocks, DO NOT USE 3 in 1 oil or some other over the counter general purpose lubricant for work on any clock. If you do not have a clock oil handy, a thin lubricant like KROIL can be used. In this case I sprayed a liberal amount into the pocket oilier shown in little oil container shown standing up in photo #9. KROIL is such a light weight oil that it's consistency is almost like that of water. It can be used safely for most applications and easily wiped away. For more information on super lube click here. (Pix 10) Once cleaning has been completed it's time to reassemble the movement and test it. In photo #10 we have cleaned the movement and replaced the back of the movement case on the gear train, here we see it being tested with the 1.5Vdc bench supply. The clock movement should move quickly and smoothly thus transferring all of it's power to the small pink gear of the clock escapement. (Pix 11) Finally another place to apply your super lubricant would be at the point were the 24 hour time plate receives its power. That would be the gear shown in photo #11 with the red fiber washer holding it in place. This gear is important in the proper operation of the 24 hour indicator for a clock of this type. If the fiber washer breaks the gearing will not remain in place and no longer drive the 24 hour plate. So you want to check this closely and see if the fiber mounting washer is still in tack. If not you may need to resort to some other type of repair as outlined below. On the front side of the clock just behind the 24 hour dial indicator plate we can see where this gear comes through to the 24 hour dial plate directly driving the gearing teeth that are actually part of the 24 hour plate itself. If the red fiber washer breaks or is missing altogether, we then have no source of power to drive the dial plate and the 24 hour part of this clock will no longer turn. Note photo 12 below. Another problem that commonly shows up in a second hand purchased QTR-24. The outer 24 hour dial ring will not show the proper time in Greenwich (GMT) time. Short of tearing the entire clock apart there is no other way to find the problem and fix it. After all what good is a 24 hour clock that only shows local time? Once the back is removed from the clock, carefully remove the outer silver trim ring by twisting the tabs behind both the silver trim ring and the clock face. Do this very slowly and be careful, if you break off the tabs you will not be able to reassemble your clock and you'll have more problems to deal with then you first started. holding the 24 hour gearing in place, in the photo below this part was broken off. I'm seeing this same problem in the QTR-24 again and again. After complete disassembly of the clock, I found out why the 24 hour geared ring would not turn. I noticed the gear in the lower right corner was flopping around loose with no way of securing it. In turn it would not mesh with the movement or the 24 hour dial ring. This proved to be a problem because we are dealing with plastic that could not be easily repaired. The plastic retainer was broken off flush even with the gear. I wound up taking a very tiny soldering iron tip and boring a hole into the remains of the old plastic shaft. I got lucky and found a piece of plastic from something laying around in the shack that had a flat black top on it. Trimming the plastic piece down to where it would fit into the old shaft, I then applied a TINY bit of a very strong two part epoxy called JB Weld. It can be found in most hardware stores and will fix just about anything, letting it sit over night. While I was inside doing repairs to the 24 hour time ring, I notice corrosion due to battery acid or a chemical reaction due to dissimilar metals in the lower left corner of the movement. Using a Dremel tool, I cleaned off all signs of corrosion and used DEOXIT contact cleaner to enhance conductivity, as this is the ground point for the negative end of our "C" cell battery. If you are in the United States, you can find Deoxit the Power Booster Pen at your Radio Shack store or by doing a search on the world wide web. Deoxit is made by Caig Laboratories it cleans any metal-to-metal contact to improve conductivity, enhance performance, reduce further oxidation and increase battery life. and our 24 hour outer dial ring should now move once the clock is placed back in operating condition, and I'm glad to say it does! The clock is also quieted down and no noise whatsoever can be heard from the movement. 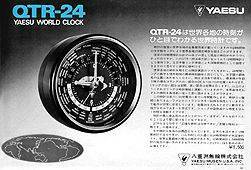 Having just bought a QT-24 Yaesu clock from a local ham, it keeps great time. However that thing was noisy!! Sitting at my desk, with the constant din of a tick, tick, tick, tick, tick, tick as it echoes in the plastic case! %#&*(^%! Wanting to try something a little different, I mounted one of my QTR 24 movements into this wooden clock case. 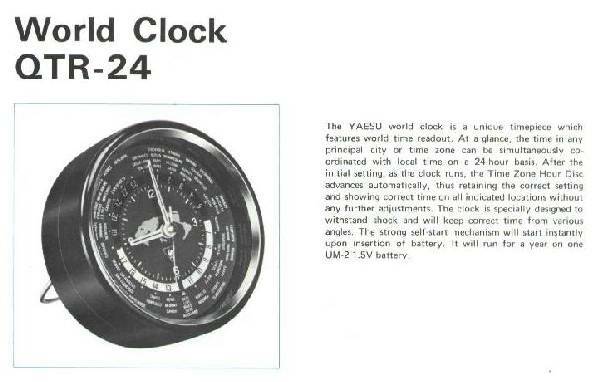 It may no longer be a totally original Yaesu tick tock, but it sure is pretty. The movement is very smooth and keeps perfect time. another in the future. You'll have to provide the QTR-24 for me to work with. 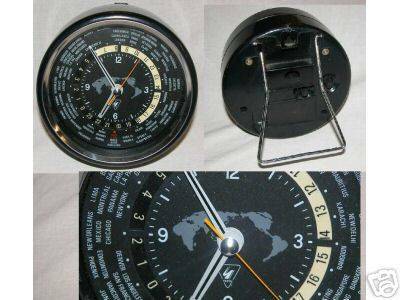 Finding parts for your Yaesu clock!